Get Through FRCA Primary: 710 MCQs is written for all candidates undertaking the FRCA Primary examination. The authors have focussed on the most daunting parts of the examination syllabus, namely, physiology, pharmacology, clinical chemistry and physics. The text is divided into two sections: the first part consists of 260 MCQs grouped by subject; the second part comprises five sample papers, each containing 90 MCQs. This format is identical to the FRCA Primary exam, thus making this book an ideal learning format. 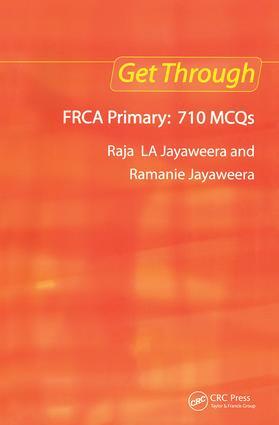 The authors, Raja Jayaweera and Ramanie Jayaweera, between them have wide experience of the FRCA examinations and are particularly aware of the standard of knowledge required to pass this initial Primary MCQ exam. Recommended to all candidates preparing for the FRCA examinations, their trainers and qualified anaesthetists wishing to update their knowledge. Containing MCQs covering all of the tricky topics of the actual exam, this is one text that all candidates for the FRCA exam cannot be without. … useful for candidates for practice so that they can perfect their timing etc…the book is good value.